Terrorism is, by it’s nature, asymmetrical, psychological warfare. 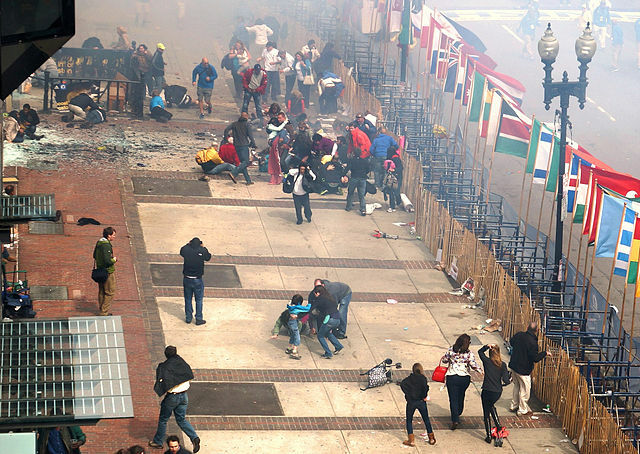 If, indeed, the explosions at the Boston Marathon were the result of either domestic or foreign terrorists, their goals are the same. Those goals are to attempt to translate irrational fears into false rational fears by the example of a single event. This is not unlike the fear and panic generated by the Sandy Hook Elementary School slaughter of innocents. Both are rare occurrences, which, due to national media coverage, bring these events into the homes of all Americans. That these events will translate into additional occurrences in diverse geographical situations is most unlikely. Yet, increased law enforcement has already happened in New York City. It is a prudent reaction to the event. Yet, in a smaller metropolitan area, a recurrence is highly unlikely. Therefore, we need to make sure, as a community and especially as parents, we do not translate our fear and media fear to our children. TV and the Internet, make it a reality and an impactful part of our life. Fear of the unknown or a perceived fear is different from a real fear. Yet, law enforcement professionals have to error on the side of caution for the safety all. Terrorists want to generate fear in Americans. It is up to us to determine whether they succeed or not. Previous Violence: Video Games & TV: How does it affect children?